Salzburg Airport is just four kilometres from Salzburg city centre. Named after its famous son, Salzburg W.A. Mozart Airport is Austria’s second largest airport (after Vienna). The airport is well connected to the main European hubs and there are direct flights to Salzburg from Berlin, Düsseldorf, Hamburg, Cologne-Bonn, Frankfurt, Vienna, Paris, London and Zurich. Salzburg Airport is served by two terminals. The historic city centre is about 20 minutes from Salzburg Airport and there is easy airport transfers by public bus or taxi. The city bus No. 2 runs daily at regular intervals (every 10 min) between Salzburg main railway station (Hauptbahnhof) and the airport. (Sundays and public holidays every 20 min.) Journey time is approx. 20 min. The city bus No. 8 runs from Monday to Saturday from the airport via Salzburg city centre (journey time approx. 15 min) to the park & ride Alpensiedlung (journey time 43 min). The city bus No. 27 runs daily from the airport via Wals/Viehhausen to the railway station (journey time approx. 40 min). If you’re intending on using the public transport in Salzburg, then it’s worthwhile buying the Salzburg Card. The Salzburg Card includes free use of public transport throughout the city, including the fortress funicular and panorama boat, attractive discounts for cultural events, discounts for various tours and excursions. It also includes free single admission to all the city’s attractions. You can buy the Salzburg Card online here or at the “Newscorner” in the airport arrival terminal. The Salzburg Airport taxi stand can be found directly in front of the airport terminal and there is also a taxi stand directly in front of Salzburg Hauptbahnhof (main railway station). Travel time between the airport and railway station is approx. 15-20 minutes. The offices of the following Salzburg Airport car hire companies can be found in the ground floor of the multi-storey car park: Avis, Buchbinder, Europcar, Hertz, Megadrive, Sixt, Sunny Cars, Federal. 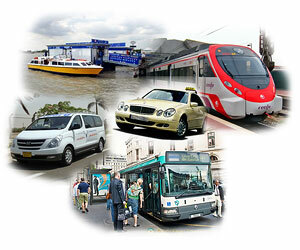 You can also pre-book your private airport shuttle from/to Salzburg Airport. Salzburg Airport is the gateway to Austria’s numerous ski resorts and there is a huge range of airport transfer services to get skiers to their resorts.